Well, I always said modelling is a winter hobby, so updates are often sporadic during the hotter months. However, necessity has driven me to do some recently. I’m attending the 009 Society 40th anniversary convention later this month with two hats on, one as part of Narrow Planet, and the other as one half of the 009 News editorial team. As part of the convention some clinics are being organised, and I’ve been asked to speak at a clinic about scenic techniques, so I best get cracking to have something to show during the talk. I’ll be taking the pier board that I’ve been working on recently. There’s enough progress on areas of this board to demonstrate a few techniques during the slot I’ve been allocated, but I’d like to do a few more things before then to help with the talk. One thing I’ve been itching to do is to start on the waves. I posted previously about techniques for modelling waves, and what you see below is essentially using the materials and method described before. There’s still a lot of work to do, so this is only the basis of the shape of the waves at present. Then there’s the colour to add, the glossy finish, and lots of ripples and ‘wavelets’ in between too. Still lots of things to do aside waves, but I work best as a deadline approaches. 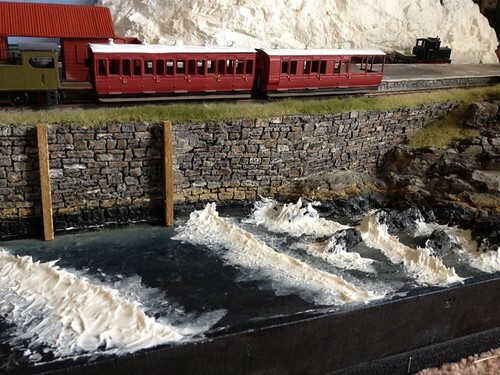 The Convention is from the 27th-29th September, if you’re a Society member check out the link above and come and say hello, it’s shaping up to be a fantastic event for smaller scale narrow gauge modellers. 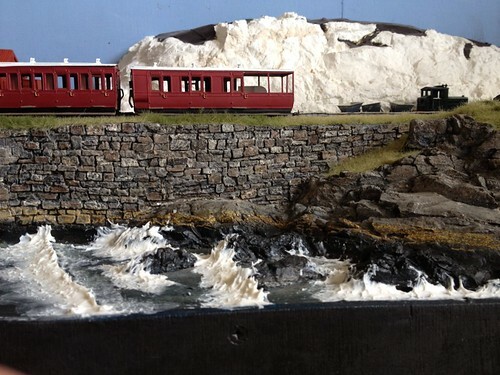 This entry was posted in Layout, Scenery and tagged 009 Society, convention, isle of skye, isle ornsay, model railway, modelling, narrow gauge, railway, scenery, waves. Bookmark the permalink. Thanks Jonathan. Have you seen the work of Troels Kirk? It was his waves that inspired me to do mine this way. Google his name and waves and you’ll see what I mean!